Holy Cross Lutheran Church and the Lutheran Church - Missouri Synod adhere to the three Ecumenical Creeds. These creeds are succint yet accurate statements of the true Christian faith. everlasting life in heaven for those redeemed by the Grace of God through the working of the Holy Spirit and the innocent suffering and death & true resurrection of our Lord Jesus Christ on the third day. Also known as the Baptismal Creed or the Roman Symbol, The Symbolum Apostolorum was developed between the second and ninth centuries. 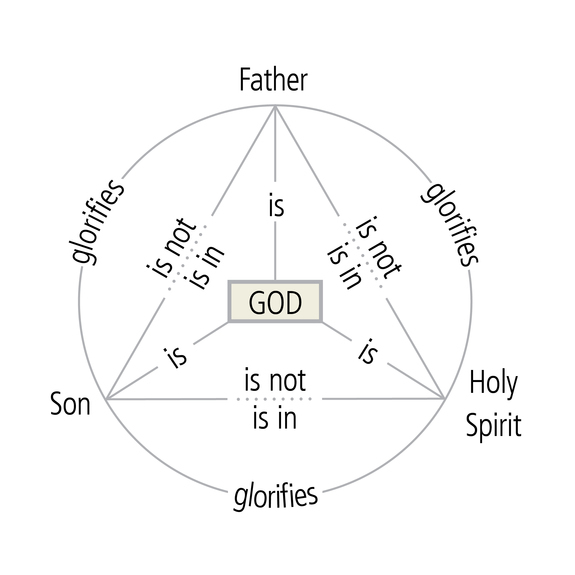 Its central doctrines are those of the Trinity and God the Creator. It has been called the Creed of Creeds because already by AD 150 it was employed at Christian centers all along the Mediterranean Sea, such as Jerusalem, Alexandria (North Africa), Rome, and even Spain. It is also used in daily devotions. Each of the doctrines found in the creed can be traced to statements current in the apostolic period. The earliest written version of the creed is perhaps the Interrogatory Creed of Hippolytus (ca. AD 215). The current form is first found in the writings of Caesarius of Arles (AD 542). 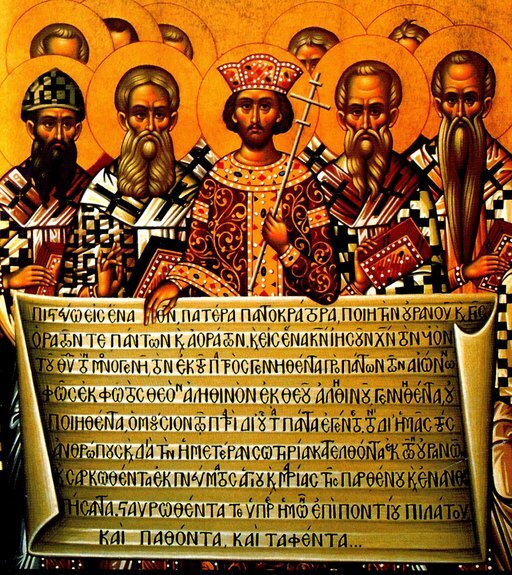 Also known as the Symbol of Faith, The Nicene Creed, was written by the First Ecumenical Council at Nicaea in AD 325 with additions (the 3rd paragraph and following) by the first Council of Constantinople (AD 381). The Creed is the profession of the Christian Faith common to the Roman Catholic Church, to all the Eastern Orthodox Churches (see below regarding filioque) separated from Rome, and to most Protestant denominations. For centuries the Nicene Creed has been the chief creed in the Sunday service. The Council at Nicea was composed of hundreds of pastors and theologians who gathered to respond to a false teaching that had arisen in the Church. This false teaching stated that Jesus was not the one true God. The second section of the Nicene Creed has phrases included specifically to refute this false teaching. In the AD 325 version, the section on the Holy Spirit was not as developed. It was at the Council of Constantinople in AD 381 that it was lengthened to its present version, this time to emphasize that the Holy Spirit is also true God. A dispute over three words in the Nicene Creed altered European history – “and the Son” (Latin filioque). was added in AD 587 by the local Council of Toledo (Spain) as a rebuttal to the Arian heresy. Pope Leo III (AD 795-816) was opposed to the filioque version and had it engraved without “and the Son” on the walls of St. Peter's Basilica. When Charlemagne failed in AD 792 to unite - by marriage – his Frankish holdings with those of the Byzantine Empress, Irene of Athens, Charlemagne challenged Byzantium’s claim of universal jurisdiction as the successor to Rome citing the dispute over the filioque. Ultimately, Rome accepted the filioque in AD 1014. The filioque dispute contributed to the Great Schism of AD 1053. The Eastern Orthodox Church rejects the filioque and cites it as a major reason preventing reconciliation with the Roman Catholic Church. The Athanasian Creed confesses the Christian Church’s belief in, and regard for, the doctrine of the Holy Trinity. It was developed in response to theological issues confronting the Church from the third through fifth Centuries. These issues focused on precisely who God is, who He is not and how we must think of him as three persons – God the Father, God the Son, and God the Holy Spirit. It was thought that the Athanasian Creed was written by Athanasius, a very influential defender of the faith (apologist) during the 4th-century debates over the divinity of Christ. However, it has been established that parts of the Creed cannot be attributed to him. The best estimate is that it was written between 435-535 A.D., probably in the southern region of France. The creed’s length means it is not used regularly and is generally used each year on Trinity Sunday.